Multiwell plates from BrandTech are available immunoGrade, hydroGrade, and lipoGrade treatments. 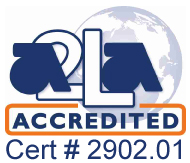 BRAND plates feature specially treated surfaces for use in a variety of immunological assays and applications, such as ELISA, RIA, FIA, pharmacokinetics, toxicokinetic, pharmcodynamic, immunogenicity studies, Branford Assays, Bovine Serum Albumin assays, and many more. Available in a full range of well shapes and colors in 96-well, 384-well, and 1536-well formats. 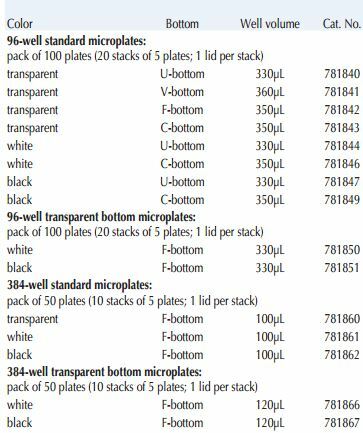 96-well BRANDplates immunoassay plates feature blue alphanumeric embossing for easy well identification. BRANDplates immunoGrade™ plates are optimized for the immobilization of IgG. They offer the highest binding capacity for molecules with mixed hydrophobic and hydrophilic regions. An excellent choice for the majority of standard ELISAs, and also suitable for solid phase immunoassays. 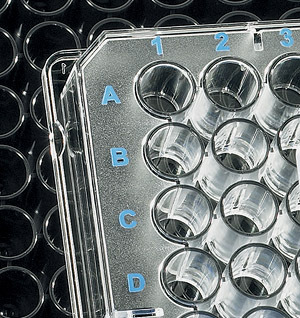 BRANDplates hydroGrade™ plates feature a strongly hydrophilic surface, with a strong affinity to hydrophilic molecules, such as glycoproteins and peptides, antibodies with predominantly hydrophilic regions, and nucleic acids. 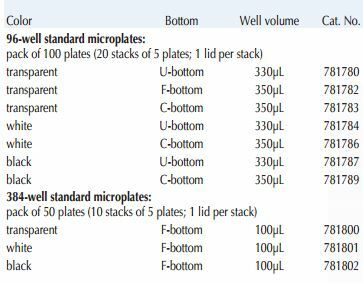 They are an alternative to the immunoGrade™ plates for homogeneous assays with hydrophobic molecules that remain in solution. BRANDplates lipoGrade™ plates feature a strongly hydrophobic/ lipophilic surface, for the immobilization of biomolecules with strongly hydrophobic regions. They are an alternative to the immunoGrade™ plates for solid phase assays, and are a choice for homogeneous assays with hydrophilic molecules that remain in solution. • Packaging is 20 stacks of 5 plates each (100 plates). Each stack comes with one lid. 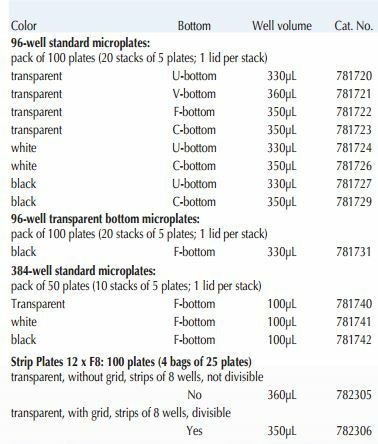 • Packaging is 10 stacks of 5 plates each (50 plates). Each stack comes with one lid. • Packaging is 5 bags of 10 plates each (50 plates). Each stack comes with one lid.